A fantastic well done to everyone who competed – many split times were faster than current PBs and of course this was great race practice before the County Championships! For the youth and top age group swimmers especially, this was on the back of a couple of weeks of very hard training and a heavy 2 hour long course session the night before! We finished a very respectable 8th overall. 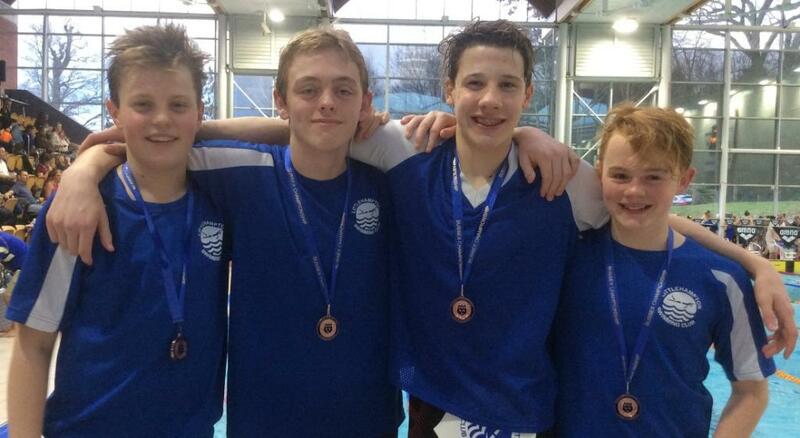 Special congratulations to our Junior Championship Boys 4 x 50 Medley team – Bronze medal winners Will Le Merle, Tom Hogg, Ollie Iden and Will Clark who absolutely nailed their 4×50 medley relay final with an awesome race! Thank you our coaches/team managers Helen Smith, Kerry Iden, Tamsin Netherwood, Ciara MacLeod and Denise Brown. Also to all our officials Mark Savill (referee), Mark Brown, Daren Pryke, Dan Le Merle and Heidi Cameron.